it reappeared in modified form, now the child of the Cabinet Office rather than the Treasury, with not much than the option of sending in a suggestion – no viewing or commenting on other people’s bright ideas. A mixed track record at best. Over the last month, you’ve submitted more than 44,000 suggestions [although another page claims 31,000 – must keep it up to date guys!] to help us get more for less. To ensure these ideas are considered in time for the Spending Review and that you, the public, get a chance to consider and rate them, the Spending Challenge website has now closed. We plan to re-open the website shortly. We’ll post suggestions we’ve received and give you the chance to vote on them. So that’s success, in their eyes at least. I hope they’ve got some whizzy software to make sense of all the suggestions in a few days (“At the end of August, we’ll take the best ideas and investigate them in further detail…”) and run some meaningful online poll so a grateful populace can vote on them. Given what it’s all about I assume that making sense of the magnificent 44,000 isn’t occupying an army of civil servants or outsourced at major expense to the private sector. Today comes news that entrepreneur/retailer Sir Philip Green has been asked by the British Prime Minister to lead a review of government spending that, like the Spending Challenge, will feed into the government’s Comprehensive Spending Review due in October. The words “up” and “joined” come to mind as do “pants” and “flying by the seat of”. I think I might be returning to this one again. “Reality” TV is not always necessarily that real. Even a casual viewer can spot how reality is squeezed into a formula. The objectionable teenagers sent to stay with the “strictest parents in the world” who always find redemption after a week having travelled a remarkably similar journey as the stroppy pair the week before, and the week before that and so on. The ritual humiliation of Alan Sugar’s would-be apprentices as he barks “You’re fired!” at the week’s victim (“It wasn’t me that did it, Sir Alan, honest”) across the board room table. But sometimes a sort of truth shines through. Undercover Boss on the UK’s Channel 4 is one of those series. A few weeks ago the chief executive of the London Borough of Tower Hamlets learned (I’m sure he knew already) that there’s virtually nothing a local authority does that someone does not want, and will often fight hard to retain. You can be cynical about the motivation of the CEOs and the companies concerned, although they sometimes seem to be genuinely surprised and even moved by what they see at the sharp end of their business. The aspect as enlightening as the bosses and their reactions is what their workers are like. This week’s edition featured Colin Drummond of Viridor, a company big in the glamorous world of waste recycling. Their people collect overflowing bins of rubbish, direct a reluctant public to the right skip at recycling centres, and sort noxious recycled materials by hand on never-ending conveyor belts. In short, pretty basic work. But in all that – literally – rubbish there are some great people doing great work. The manager at a recycling centre constantly innovating to encourage customers to recycle more. The cheerful efficient agency worker with no job tenure on a sorting line. The depot hand who through his own choice took leave every time he had to go up to London for his cancer treatment. It was a lovely example of the intrinsic motivation which comes from within ourselves that psychologists like Alfie Kohn talk about (see my earlier post on Time to sack public sector employees? – the answer’s No by the way). Remove barriers that rob people of pride of workmanship. It’s not spoken about often enough. Even less is it implemented by managers. Undercover Boss at its best reminds us why it is so powerful. An “Exclusive” in this week’s Municipal Journal trails an article in their next edition about place-based budgeting (son of total place, grandson of community-based budgeting, younger brother of localism and so on…). Treasury officials have warmed to the idea of merging public services budgets across a locality – such as council, health and criminal justice spending – into a single pot, and devolving decision-making over how cash is spent, and services prioritised, to local managers. There’s a clear attraction for local politicians of that sort of devolution although I’m not sure they’d accept it should be to “local managers” and it’s accompanied by the threat that devolution is expected to go beyond public agencies to communities. My advice would be softly softly catchee monkey, for those old enough to remember that piece of folk wisdom. Yes, it might be good to bring public services together locally. But the lessons of systems thinking would urge caution. One of the basic ideas of systems thinking is to work out what the system is, what should be part of it and where you should draw the boundary around it. The system needs all its parts to work in harmony (for which read efficiently and effectively) for the greater good. But individual parts, no matter how superbly designed, will not function without being part of the whole. Systems thinker Russell Ackoff used to exemplify the idea with the everyday motor vehicle. Individual parts of the engine will not work without being joined to the rest of the engine. The engine will not work without a fuel supply and a transmission system. And so on. “The car” is the system. It stills needs inputs to work – fuel, a human driver, occasional intervention for maintenance and repair – but with these taken care of it works in harmony as one system. The challenge for those looking to brigade services on a local geographical basis is the answer to the question “What’s the system?” If it’s essentially a local area – probably defined by the geographical boundary of a local authority, fine and well. But what about functions that also form parts of other systems? a ministry of justice that sets policy and makes key interventions? more recently and tragically, the report commissioned by the Birmingham Children’s Safeguarding Board into the death of Khyra Ishaq concluded that had there been better assessments and effective interagency communication over a period of time it [Khyra’s death] could have been prevented. But it seems that each part of the safeguarding system thought its being part of another system was more important. The rush to place-based budgeting brings to mind the quote (variously attributed) that you should be careful what you wish for because you might get it. Time to sack public sector employees? One way or another UK public agencies need a radical response to the pressures from the economy and the coalition government. When the recession first hit in 2008 Japanese motor manufacturers in Britain seemed to do everything they could before they actually made staff redundant, if they ever did. Toyota, Nissan and Honda were all good examples. Regular readers know the importance I assign to employees in driving improvement in an organisation – see for example my post on How to improve government (and keep improving it). From the USA comes advice from author Gregg Stocker on his blog Avoiding the Corporate Death Spiral (named after his book of the same name). From a North American and private sector perspective he lists seven steps to avoid layoffs. This is my take on each, in the order Gregg lists them. Shortened Work Week: Although akin to a pay cut, a shortened workweek forces everyone to participate without the loss of jobs. Also, receiving time off helps compensate for the reduction in pay. Sounds sensible – better to earn even 60% of your former wage than 0%. The sums to produce any saving needed should be easy to do. I’m not aware of this happening anywhere in the UK public sector. Hiring Freeze/Attrition: Although an obvious step, I have worked with companies that laid off in one part of the company while hiring in another. Any positions that are critical to fill should be done by transferring and training existing employees. Fairly widely used but how effectively? “Transferring and training” is critical but how creative is the public sector in moving people around and supporting them in those moves? And since everyone’s urged to work in partnership with other agencies, what about transferring people between organisations? Elimination of Dividends: In spite of what many people believe, the resulting damage to the organization caused by a layoff does not protect shareholders. By protecting its workforce, companies are actually actually protecting future returns for shareholders. Studies have shown that companies that resist deep cuts during downturns recover much more quickly than competitors (in terms of earnings and share price). Stocker’s only step not directly relevant to most of the public sector. But the ethos could apply to agencies required to make a set return on capital for the government. Focused Kaizen Activity: Improvement activities should be focused entirely on reducing costs (while improving or maintaining existing quality levels). Kaizen activities focused on cost reductions will prevent employees from being idle during downturns and assure that the savings achieved will be sustained once business returns. Something like this should be in the organisational DNA, not a response to a crisis. Stocker says kaizen. Others might say systems thinking or other structured improvement. For this particular purpose it matters not. I have recently seen an example of a local authority function where careful measurement proved that 26% of the total cost did not add value for customers and could in principle be eliminated. The challenge, which many wrestle with, is the ungainly named benefits realisation, which in this example would mean eliminating 26% of the budget. Pay Cuts: As a last resort, pay cuts should be implemented to save jobs from being eliminated. I believe in implementing across-the-board percentage cuts with executives being asked to volunteer a larger percentage. Of course pay cuts and pay freezes need to be in the mix as that “last resort”. And senior managers taking a larger cut sends the right message. But without all the other good things Stocker mentions this inevitably goes down like the proverbial lead balloon. Of course some of these actions imply less work being done and so less service being delivered. But that’s going to happen anyhow. And some would need a major culture change in the UK – amongst politicians, senior managers and trade unions. Put to the point could they all make the leap? I have my doubts. 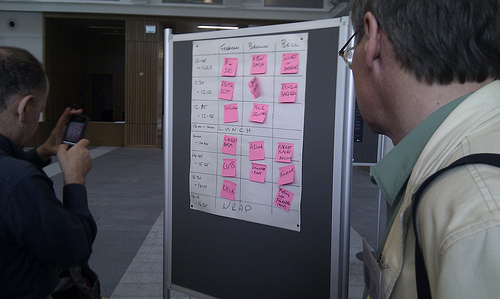 An invitation to an unconference? What was this? I found out when I registered for ScotGovCamp on 31 July at the brilliant new Edinburgh Uni Informatics Forum building. A new venture for me – dipping my toes into the water of govcamps – a.k.a. self-organised unconferences for people that work in and around government. For those of you who’ve been around the block a few times the easiest way to describe a govcamp is Open Space on speed. The speed element is provided by technology, as in ICT. In this case – both its use during the session and the unifying theme of the day. Like Open Space the agenda belongs to the participants, about 100 of us who gathered around a flip chart and in 5-10 minutes constructed the agenda for the day, three streams of eight sessions, each with the structure (if any) that participants chose to give it. The topics? – as wide as “Cuts” or as narrow as the implications of a particular piece of software. The format? – maybe a Powerpoint presentation followed by discussion, a circle of delegates with or without one or more facilitators, “tag” discussion (as in tag wrestling), participants coming and going as they wished, a high proportion of delegates tapping away at various pieces of technology taking notes, tweeting, blogging, recording (sound or video), taking photos. shared bits and pieces on delicious. blind spots – too many to list but exemplified by Facebook’s community pages for each UK council – I suspect in many cases unknown to councils, and if they are, unloved and ignored as a source of feedback and understanding. (I did my own modest piece of research on UK councils’ awareness and use of business networking exemplified by LinkedIn – I was amused to see several local authority CEs set up a LinkedIn profile after I e-mailed my business newsletter to them a couple of months ago). Our Eaga ShowerSmart saga (see previous posts here and here) continues. E-mail today from a company called Iguana Direct, clearly looking to associate themselves with the cuddly pet rather than purveying the exotic reptile. Thank you for your recent application for an Eaga ShowerSmart. Unfortunately, we are unable to send one out to you as our records tell us that we have already sent an Eaga ShowerSmart to your address. We can only send out one free Eaga ShowerSmart to each household in Great Britain. they (or someone) have not sent us one but two, six months apart. So, no thanks, no gizmo needed here. It’s good to see the private sector being so inefficient when most of the media assume it’s the public sector that is the sole perpetrator of all evils to do with waste.